The Chatham collection by Safavieh contrasts ancient Moroccan motifs with a fashion-forward palette of bright and pastel colours. This transitional and contemporary rug offers a thick wool pile in modern designs to complement any home decor. These stunning hand-tufted wool rugs are crafted in India to recreate the elegant look of hand-knotted carpets for today's lifestyle interiors. This is a great addition to your home whether in the country side or busy city. Vacuum regularly and spot clean; for hard-to-remove stains, professional rug cleaning is recommended. This area rug is one of the easiest and most fashionable ways to refresh a room with character and style. Please note: The digital images and product dimensions on our website are as accurate as possible. 60 day Manufacturer Warranty for defects only, for warranty information on this product, please call our Internet Customer Service Center at 1-800-435-4654. Normal wear and tear is not warranted. Visible damages not noted upon delivery will be determined to be customer damage and will not be warranted. Returned items must be in new or unused conditions with the original manufacturers packaging. All products are inspected upon arrival and we do not accept worn, dirty or stained merchandise. 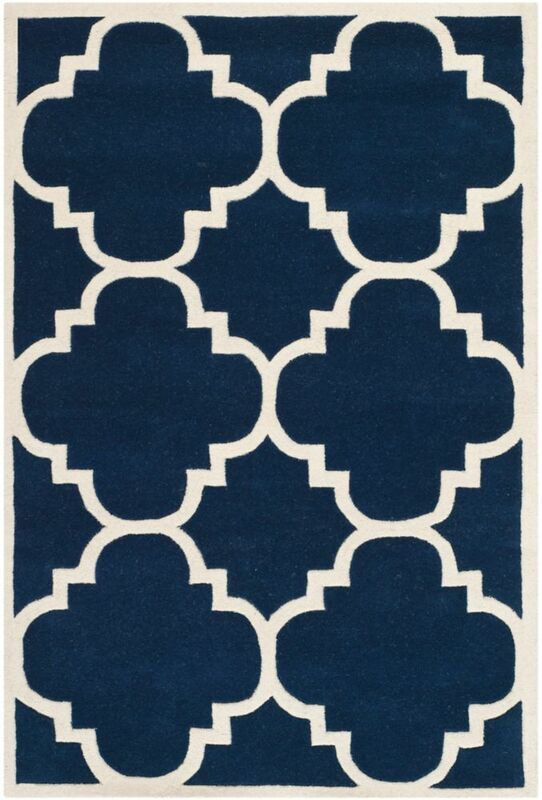 Chatham Abe Dark Blue / Ivory 4 ft. x 6 ft. Indoor Area Rug The Chatham collection by Safavieh contrasts ancient Moroccan motifs with a fashion-forward palette of bright and pastel colours. This transitional and contemporary rug offers a thick wool pile in modern designs to complement any home decor. These stunning hand-tufted wool rugs are crafted in India to recreate the elegant look of hand-knotted carpets for today's lifestyle interiors. This is a great addition to your home whether in the country side or busy city.